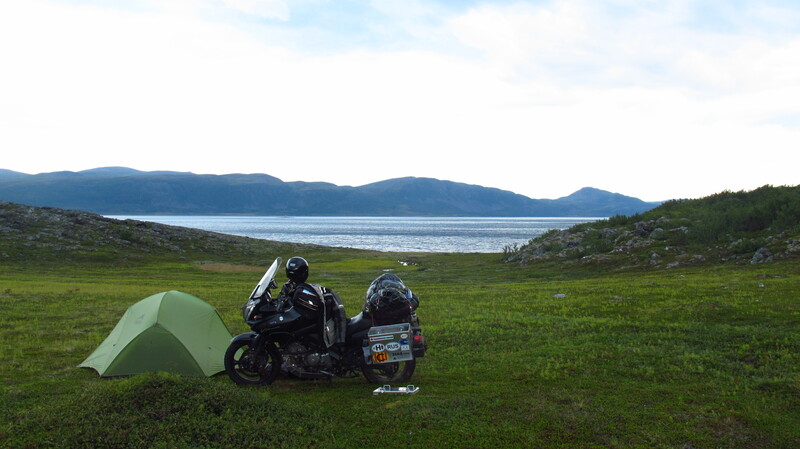 I decided that since I still had 12 days to get to Helsinki, and I was probably only going to have the chance to explore this part of the world on a motorbike once in a lifetime, I would take the advice I had been given the day before and make a little detour to visit some places. 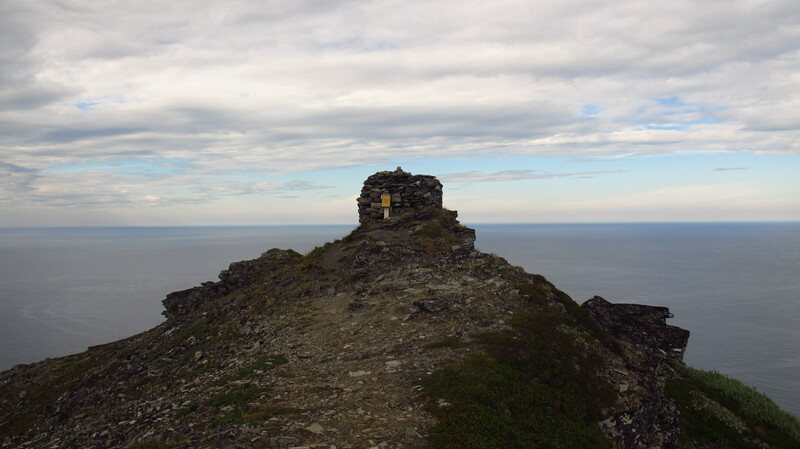 The first one, and the one that the man I had met the previous night had insisted the most on visiting, was the Tanahorn, a peak on the coast near Berlevag, three big fjords east of the Nordkapp, from which I was told I would have wonderful views if the weather was good. 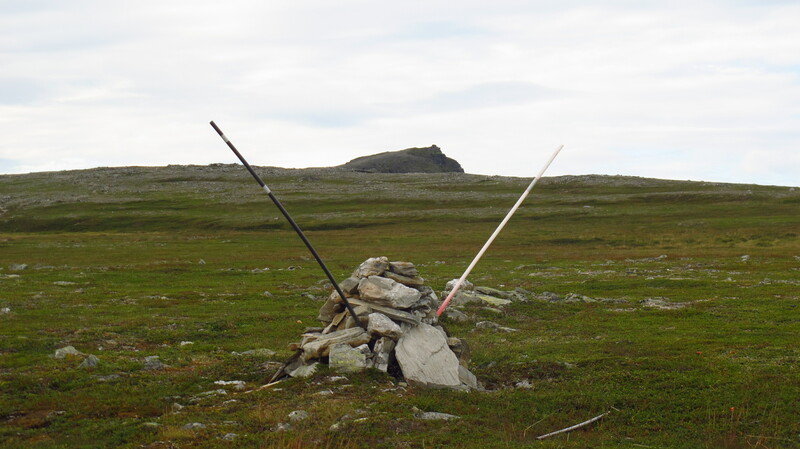 He called it ‘his Nordkapp’, and that was enough to make me want to visit it. My father loves the mountains and everything related to them, and he has a few places he likes to call his own. When he talks about one of those places, I know it is a special place, normally away from what most people visit and of outstanding beauty, so when I heard that man describe it in those words, I could not resist the visit. It took me all morning to ride there, including crossing the border into Norway. Once in fjord land, I had to go a long way north on a road that I would have to undo later, as it did not lead anywhere else, but the views alone were worth the trip. The road followed the coast near the water, winding its way along the fjord, the day was beautiful and the air cool, it was another road to put down in my book of favourites. Once I got to Berlevag I had to go on for a few kilometers on an unpaved road, and then I saw a couple of parked cars and a sign indicating the path up the hill. I left everything on the bike an started walking dressed in riding gear, as it was a bit cold and since it was only about 3km I did not bother to get changed. Soon I was sweating despite the cold, and had to take off the jacket an carry it under my arm. The path went up over gentle slopes and soon the Tanahorn came into view. It was a sharp rocky peak that stood out in the distance, with a mound of rocks built on top of it. In about 20 more minutes I reached the top, and the views were more than worth the ride and the walk up there. 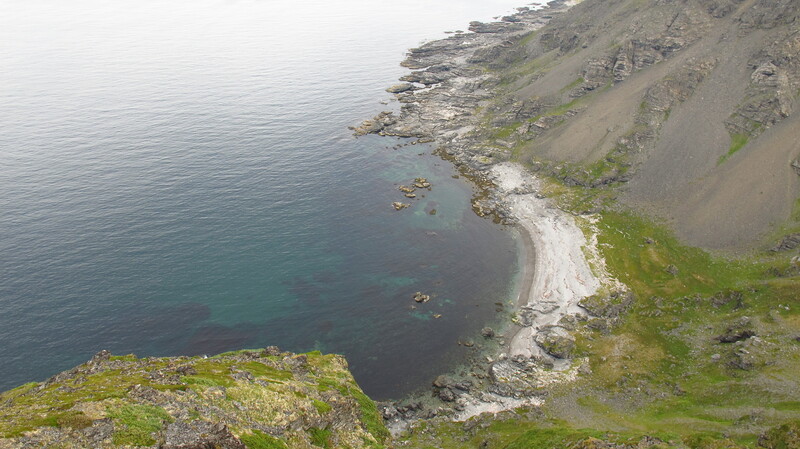 The sky was clear, and I had a perfect view of the sea and the surrounding fjords, the cliffs and the rocky slopes going all the way down to the beaches, covered in pieces of wood that the sea had carried from Siberia. It was amazing. I took out the notebook that was there and left a quick note. 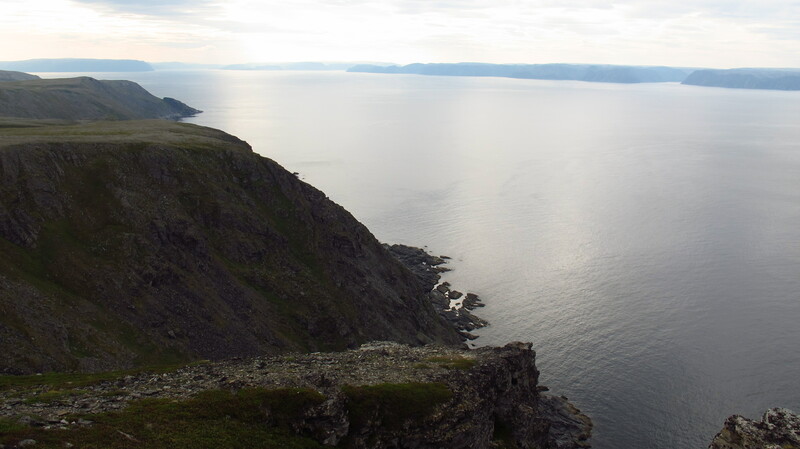 Then I sat, relaxed and enjoyed the feeling of the sun on my face for a while before heading back down, as I still had a long way to the Nordkapp and I was not sure I would make it that day. Back on the bike I studied the route on the GPS and hesitated between heading straight to the Nordkapp or going up to the other point between here and there, where there was the northernmost lighthouse in Europe. Trying to make it to the Nordkapp that day would have been too much, so I decided to take it easy and visit the lighthouse. I had to undo a long way, and by the time I was back on the main road, it had already got late and I was quite tired. 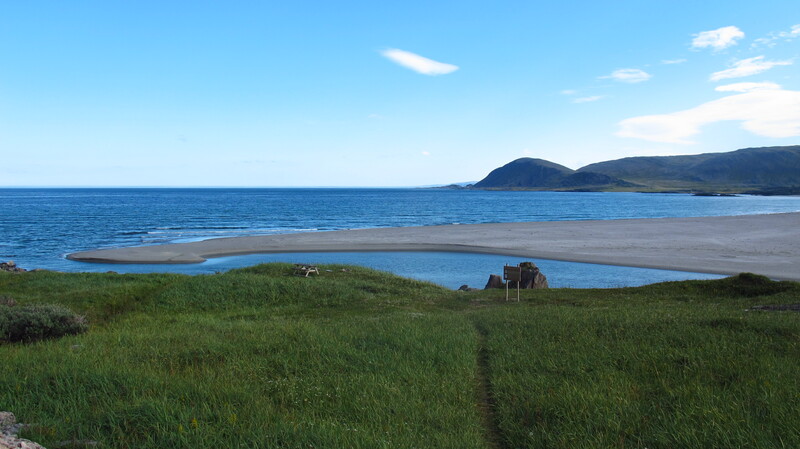 I started making my way up the road that lead to Mehamn, but I realized I would get there quite late, so I decided to look for a place to set up my tent and spend the night. You can camp anywhere you want in Norway as long as it is more than 150 meters from a house, so it sounds quite easy, but the difficult terrain means that it takes a while to find a good spot. After a while, I found it. It was on a very gentle slope going to the end of a very small fjord, hidden away from the road, with beautiful views and easily accessible on the bike. I rode down and set camp. However, things started to go wrong soon. When I tried to cook dinner, my stove decided to stop working, so I had to collect wood and make a small fire to be able to have a hot supper. Then, when I went to bed, a very strong wind started. It was not constant, it was just sudden gusts of wind that blew wildly for a few minutes, from a different direction each time. It made the tent flap loudly, and to make matters worse, at about 4 am, I hear a crashing noise outside. I open the tent to discover that the wind had toppled my bike, which was lying on its side. I put it up again, saw that there was no damage done and turned it so that it offered less resistance to the wind. I went back into the tent and tried to get some sleep. 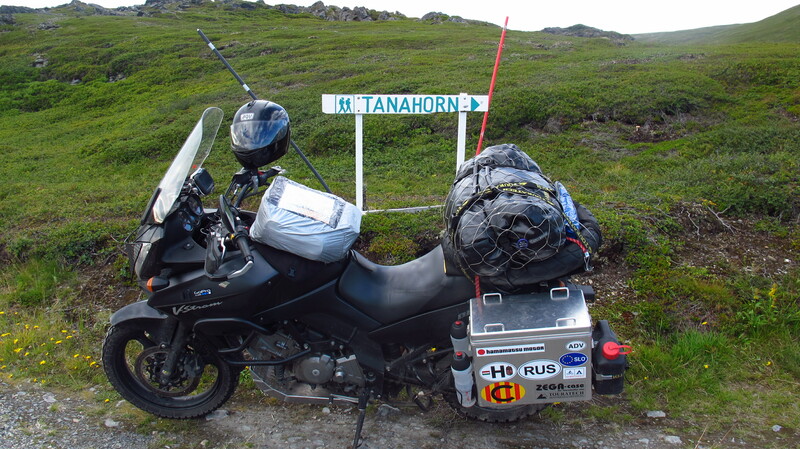 This entry was posted in Stroming The World 2013, Travel and tagged Tanahon, wind by Kilian. Bookmark the permalink.